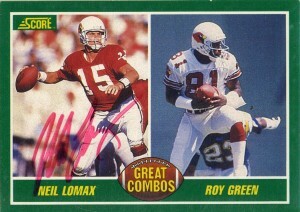 Incredibly underrated and forgotten quarterback Neil Lomax lit up the scoreboards during the 1980s for the St. Louis Cardinals. Discovered by then offensive guru Darrell ‘Mouse’ Davis up at Portland State, Neil helped put the school on the map setting offensive passing records in the NCAA. 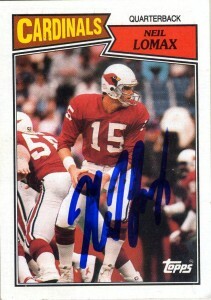 Lomax would be drafted in the 2nd round of the 1981 draft (,and finish as one of only 2 quarterbacks[ Wade Wilson], to make the Pro Bowl from that draft). In 8 seasons, he only posted 2 losing records- but finished with a 47-52-2 record. His career highlights would include a 1984 in which he threw for 4614 yards, (which still stands as a team record), and he’d lead the NFL in attempts, completions, and yards averaging 282 yards a game in 1987. An injury in 1989 would curtail his season, and while he’d sit on IR all year, doctors would discover Lomax had an arthritic hip, effectively ending his career. It’s a shame really because if Lomax just had a few more years under his belt, he’d probably be remembered by Cardinals fans as affectionately as Kurt Warner is. 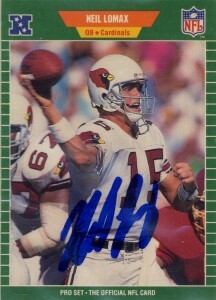 (He was at the time of retirement and still over 20 years later, ranked in the top 100 of quarterbacks since 1950.) 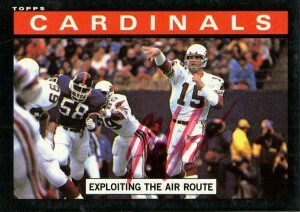 With the untimely loss of Lomax, the Cardinals would quickly collapse into the doldrums of the NFC East where they’d remain until the emergence of Jake Plummer in 1998. 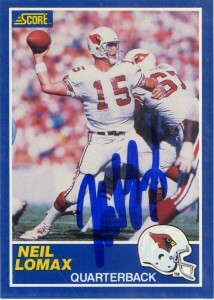 I met Neil at the CGA Youth Golf Tournament in 1993. He was really flattered by the drawing I did of him and his kids clamored around to look at it to, “Oooh and ahhh”. Neil asked if I had a problem letting his kids hang it up in their room (to which I obviously didn’t) and then signed all of the cards I had brought. An accomplished golfer, Neil is president of the ProMax corporation and has dabbled in coaching. Lomax was inducted into the Oregon Sports HoF in 1993, and the College Football HoF in 1996. He and his family currently reside in Oregon.